In January 2018, a revision of DIN EN ISO 10077-2 was published, that now provides for two different methods to calculate the thermal performance of profiles. What does that mean for the representative Psi-values stated on the BF data sheets? This question was discussed during a meeting middle of 2017, when the Warm Edge Working Party decided to clarify this question with another project order to ift Rosenheim. 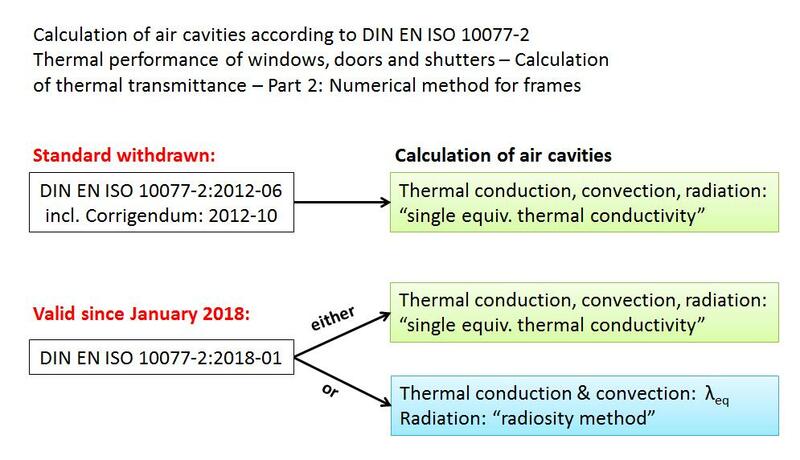 DIN EN ISO 10077-2 specifies a method for the calculation of the thermal transmittance of window frame profiles Uf and of the linear thermal transmittance of their junction with the glazing Ψg. The Psi-values for façade profiles are calculated according to this standard as well. A two-dimensional cross section of the window- resp. façade profile is modeled in appropriate software and rasterized with a resolution sufficient for the numerical simulation. Air-filled cavities are consigned with prescribed key figures, so-called equivalent thermal conductivity values („single equivalent thermal conductivity“), considering all three mechanisms of thermal transmission – conduction, convection and radiation. The revised version of the standard dated January 2018 now includes an alternative approach for the treatment of air cavities. This new method is considerably more complex. It still considers the influence of thermal conduction and convection with an equivalent thermal conductivity value, but the heat transport through radiation inside the cavities is calculated separately according to the radiosity method. According to DIN EN ISO 10077-2:2018-01 the simulator now can choose which of the two valid methods he wants to use for air cavities. To determine the values of the BF data sheets, firstly, several test specimens made of stacked spacer profiles are measured with the guarded hot plate method according to ift guideline WA-17/1. Then, the equivalent thermal conductivity value of the spacer system is calculated with statistical evaluation from the measured results. Finally, with this declared conductivity value, the representative Psi-values stated on the data sheets are calculated according to DIN EN ISO 10077-2 and the prescriptions of the ift-guidelines WA-08/3 and WA-22/2. Aim of the project was to clarify whether if the choice of the calculation method has any influence on this determination of representative Psi-values. Based on the results it was planned to specify one of the two methods as a uniform procedure in the regulations of the Warm Edge Working Party. Within the framework of the project to compare the methods, the cross sections of the representative window- and façade profiles and glazing designs were calculated with three spacers of different thermal performance. As expected the method only has minimal influence on the Psi-values, which is within the calculation accuracy. In nearly all cases of Psi-values for windows, a difference could only be recognized in the fourth decimal place. For façade profiles, the differences were slightly higher, up to 0.002 W/(m∙K). During the meeting of December 5th, 2017, the BF Warm Edge Working Party decided, that from January 1st, 2018, all newly established data sheets shall solely be calculated with the new radiosity method. This will continue to allow for a real comparability. Because of the very minor impact, data sheets for windows published before January 1st, 2018 will remain valid, whereas the data sheets for façade profiles were recalculated according to the new method and updated end of October 2018. This text was a press release of the BF Bundesverband Flachglas of November 2018. Just in time for the trade fair “fensterbau frontale 2018” in Nuremberg, Germany, the most important event of the industry this March, you can find my latest article with an inventory on warm edge in the journal GFF-magazine in issue 3/2018 – or directly here (in German language). As before, I explain the advantages of warm edge for insulating glass and discuss the question why there are still spacers made from aluminium. Unfortunately, I made a mistake in my latest article for GLASWELT issue 4/2017: One BF-data sheet, W28 for TPS IGK 611 of IGK Isolierglasklebstoffe GmbH, is missing in the chart on page 96. Please find a corrected version of the article (in German language) here. Not that long ago, during GLASSTEC 2016, several new spacer solutions for thermally improved glass edge bond were introduced. My latest article for the GLASWELT-magazine gives an updated overview of the systems and informs about the latest trends. You can find the article (in German language) here. The BF data sheets – which list representative Psi-values for windows and for façade profiles – published by the Bundesverband Flachglas e.V. (“BF” = German Federal Flat Glass Association) are often used to determine UW– and UCW-values. This comparatively simple (but standard-conforming) method is well known in the market – far beyond the borders of Germany. A new project of the BF “Warm Edge” Working Party now aims to permanently ensure trustworthiness and reliability of the declared values. The representative Psi-values of the BF data sheets for windows and for façade profiles are calculated according to EN 10077-2 using the so-called equivalent thermal conductivity λeq,2B, (which is determined by measurement). The basis for this approach, as well as for the validity and application of these representative Psi-values are the three ift guidelines about thermally improved spacers, namely WA-08, WA-17 and WA-22. To declare the value of λeq,2B, three pairs of test specimen made from desiccant-filled and butyl-equipped spacers are measured, followed by a statistical evaluation. The value is shown on the BF data sheets on the bottom under ‘Two Box model Characteristic values’ in ‘Box 2’. 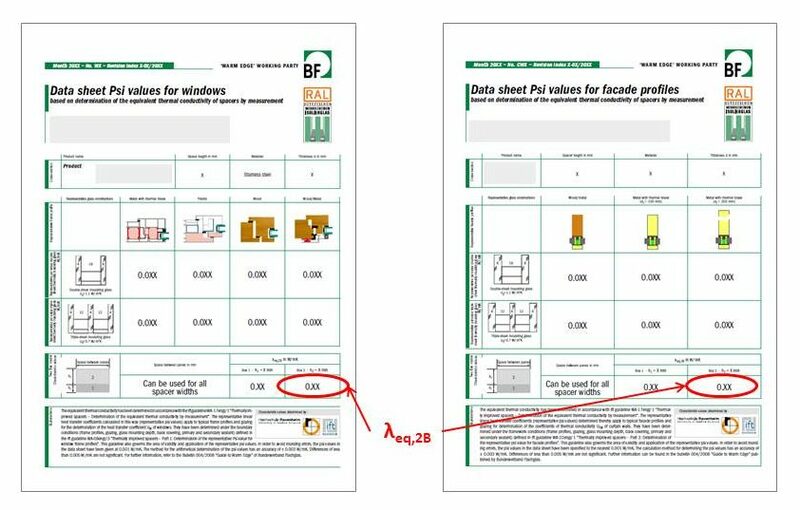 Picture: In the future, the value λeq,2B, declared on the BF data sheets shall be rechecked on a regular basis. The value is not suitable for a comparison of individual thermal performances of warm edge systems. For that purpose, only the indicative Psi-values shall be used, because they also include the influence of the spacer height h2. Apart from a few exceptions, the sole difference in calculating warm edge systems are the input data λeq,2B and the height h2 of the spacer box 2. Therefore, the value λeq,2B is particularly important. It determines the Psi-values which are the most important performance factors of spacer manufacturers in their daily competition. Consequently, during their last meeting on February 9th, 2017, the members of the BF “Warm Edge” Working Party have agreed a voluntary commitment to scrutinize the equivalent thermal conductivity values λeq,2B every two years. This shall allow the detection of any deviations compared with the original measurements, and as an additional benefit will provide the security that the values declared on the BF data sheets are still correct. The costs of the procedure will be borne by the respective spacer manufacturers. The measurements shall exclusively be made by ift Rosenheim. It is worth emphasizing that the samples for these check measurements shall be collected from the spacer processing companies in the market, and not supplied by the spacer manufacturers themselves. From 1st of January 2017, the RAL Gütegemeinschaft Mehrscheiben-Isolierglas e. V. (“GMI” = German Multi-Pane Insulating Glass Quality Association) has already implemented an external monitoring of the insulating glass components spacer, sealants and desiccant. It aspires to later include the control of λeq,2B, planned to be done every two years, into the ‘RAL-GMI Quality monitoring and testing standards for multi-pane insulating glass’. As of the first re-measurement, the currently valid BF data sheets, available online on the BF websites, will be equipped with an expiration date of validity. The first check and new dating of the data sheets shall take place in 2018. The ‘Warm Edge’ working group is a subcommittee of the Technical Committee of Bundesverband Flachglas. The participants in the working group are members and sponsoring members of BF. Scientific support for the working group is provided by Prof. Dr. Franz Feldmeier, Rosenheim University of Applied Sciences and by Mr. Norbert Sack, ift Rosenheim. 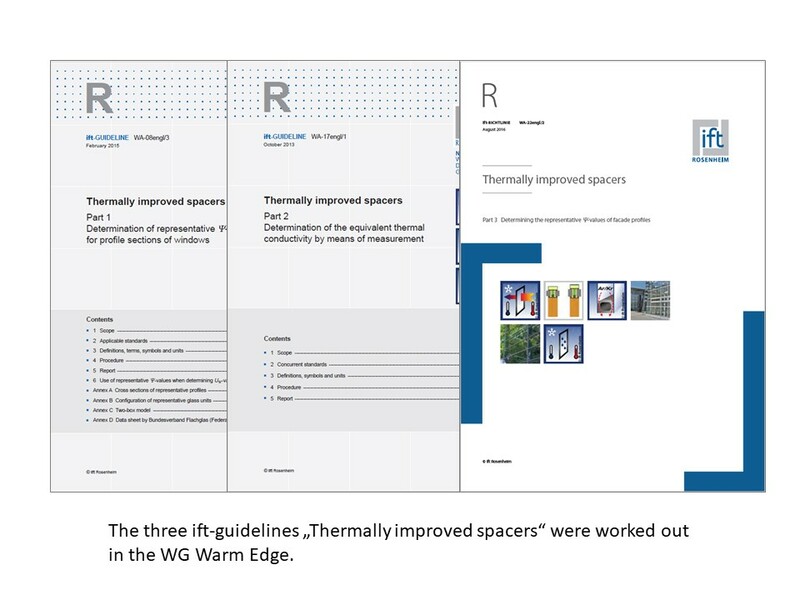 Unfortunately, the typo gremlins got into the last version of the BF Bulletin 004 “Guide to ‘Warm Edge’ for windows and facades”, and that of all things in the formulas for the calculation of Uw and Ucw. Immediately upon discovery the typos were corrected. As of now, the latest version (Modification index 4, March 2017) is available for free download on the BF websites. Or you can directly get to the pdf-files of the Bulletin in German language here, to the English version here, and to the French please click here. 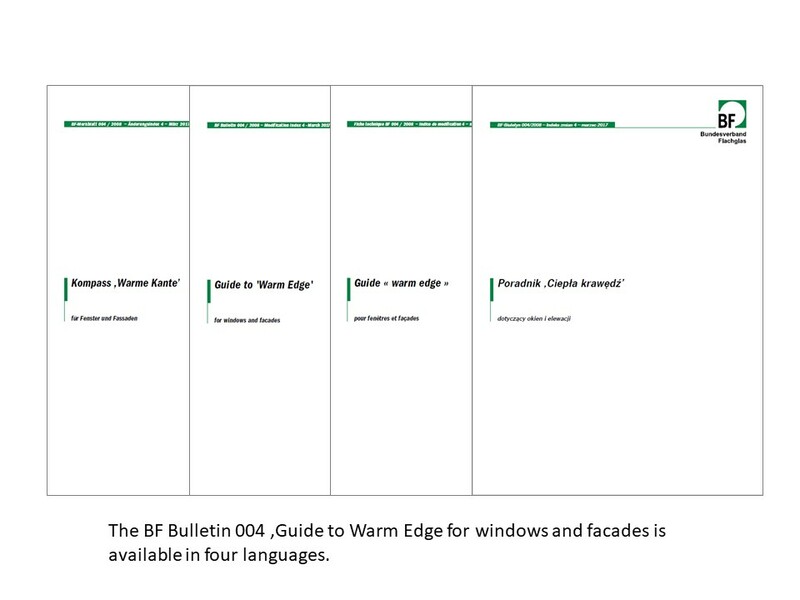 The BF-Bulletin 004 ‘Guide to warm edge for windows and facades’ is a good introduction to the topic of warm edge. It is a manual for the often used BF-data sheets with representative Psi-values for windows and for facade profiles and explains the boundary conditions for the use of the BF-data sheets according to ift-guideline WA-08 (windows) and WA-22 (facades). By the request of many, the bulletin was translated into English and French language. You can find both versions on the literature page of my website, or you can directly download the English paper here and the French one here.